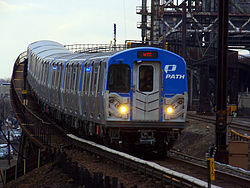 ↑ Port Authority of New York and New Jersey. "PATH at a Glance – April 1995." Carleton, Paul. (1990). The Hudson & Manhattan Railroad Revisited. D. Carleton Railbooks. Cudahy, Brian J. (2002). Rails Under the Mighty Hudson: The Story of the Hudson Tubes, the Pennsy Tunnels and Manhattan Transfer. Fordham University Press. ISBN 0-8232-2190-3. Davies, John Vipond (1910). "The Tunnel Construction of the Hudson and Manhattan Railroad Company". Proceedings of the American Philosophical Society. Philadelphia: American Philosophical Society. 49: 164–187. หน้านี้แก้ไขล่าสุดเมื่อวันที่ 22 กุมภาพันธ์ 2557 เวลา 11:35 น.